Welcome to the Shop Selections! 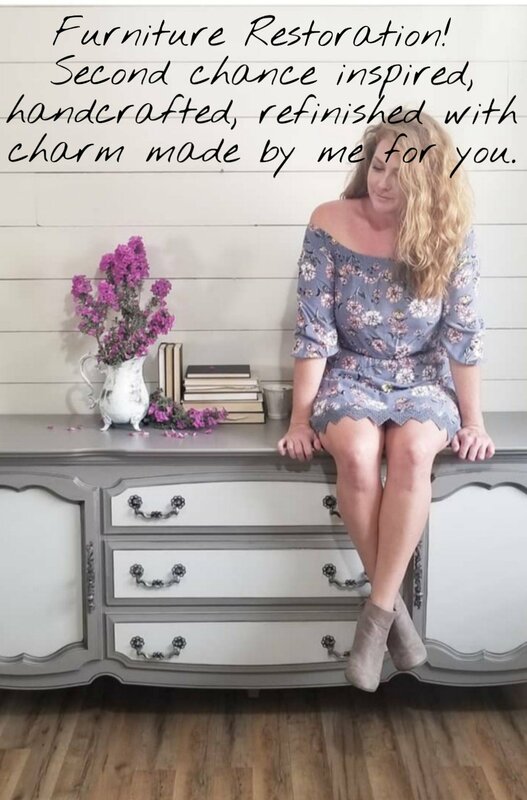 This is where you can find furniture pieces that have been refinished by Second Chance Charms and are available for purchase, waiting to be statement pieces for your home! Don’t forget to check out our Artistic Home Design page for other pieces available that have a different personal touch by artist Maureen Flanigan! Want first dibs on new pieces!? Looking for something that isn’t finished? Want to design your own piece? Click over to In The Studio and see what is available for customization! A Thunderbird Furniture dresser turned faux Library Card Catalog unit, for that farmhouse charm. I love this neutral faux reclaimed wood finish, using Sherwin Williams Sand Beach, Snowbound White and Maga Greige. Updated all hardware in Metal Cup Pulls and Card Catalog Handles all in Bronze. Dresser: 10 Drawers in total. Measurement: 44″ wide x 18″ deep x 42″ tall. Check out her debut over at Dresser turned Faux Library Card Catalog Unit. A beautiful 1940’s bow front dresser, Duncan Phyfe style, ribbed design on the sides and four BIG drawers, all dovetailed & slide smoothly with original brass hardware. Refinished in Sherwin-Williams Sand Beach and glazed in Well-Bred Brown. Original brass hardware polished. Fine art painting in acrylic of a vintage abandoned car. Measurements are 19″ deep x 34″ wide x 47″ tall. Check out his debut at Abandoned Car Dresser- The Artistic Home Design. Refinished in Sherwin-Williams Tricorn Black and heavily glazed in gold. Distressed for an added vintage look. The top and inside are stained in Minwax Chestnut to match his original days. I added a Gold Metal Arrow Handle from Hobby Lobby to help open the little compartment door he has to hold all sewing necessities. The working rotary sewing machine operates via a pedal at thigh height, which you just lean into with your leg. Closed cabinet measures, 21.5″ wide x 17″ deep x 30.5″ tall. Check out his debut at Vintage New Century Sewing Machine Cabinet. Check out her debut at Ornate Buffet and Mirror. When I picked up this lovely gal I knew right away what color she needed to be! NAVY! There is just something about blues! A buffet by The Bannister House Group, refinished in Sherwin-Williams Rainstorm and glazed lightly in brown in the lines! Original brass hardware polished. Top stained in a medium brown color. Perfect for any space! Buffet: 2 long Drawers. 2 doors that open into one long shelf inside. Measurement: 48″ wide x 18″ deep x 33″ tall. Magazine table inside refinished in Sherwin-Williams Snowbound. The base is done in many layers using Maga Greige, Agreeable Gray and Snowbound. Glazed in Rockweed. Measurements are 14″ deep x 27″ long x 25.25″ tall. Please check out In the Studio page for furniture pieces that are up and ready to be customized to your liking. Every Second Chance Charms piece is properly prepped and refinished in professional grade materials as well as sealed with waterbase polycrylic so it will not yellow over time. We do not use chalk paints. We do not use wax. ***Cleaning Second Chance Furniture: Use a slightly damp cloth with or without mild soap. Please avoid harsh chemicals. Always use heat mats, placemats, and coasters to protect your furniture. Keep your painted furniture away from extreme temperatures or humidity. Avoid excessive water. Very durable long-lasting finish. *** All sales are final. Local delivery and nationwide shipping available for an additional fee. Please contact me with your address prior to purchase for a shipping quote.